Baby Driver feels like the movie that filmmaker Edgar Wright (Scott Pilgrim, Shaun of the Dead, Hot Fuzz) was born to make. Although only his sixth full length feature in a relatively young career, Baby Driver feels as if it’s the culmination of everything that’s defined Edgar Wright as a director. That may sound pretentious, but really this poppy mashup genre blend is first and foremost concerned with giving audiences a bona fide, feel good hit. Baby Driver follows the exploits of “Baby” (Ansel Elgort of Fault in our Stars fame) a young, fresh faced and quiet loner with uncanny ability behind the wheel of any car. 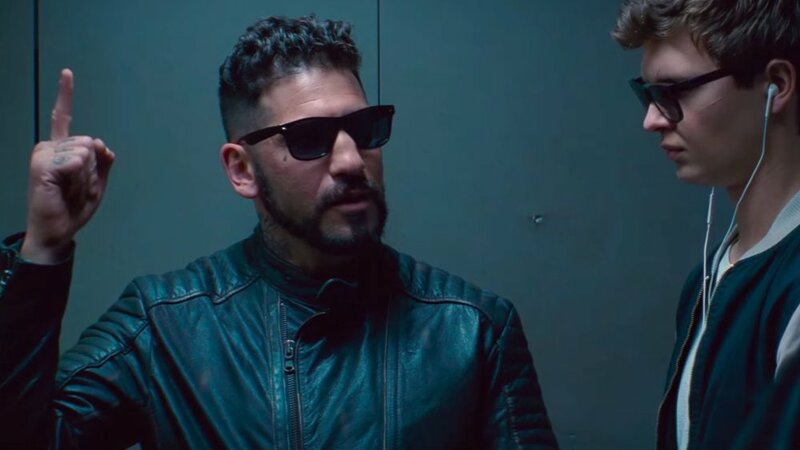 He’s a getaway driver for hire employed by Doc (Kevin Spacey) who runs several teams of bank robbers (including Jaime Foxx, Jon Hamm, Eliza Gonzales, Jon Bernthal, Flea, and Lany Joon). Baby is working towards paying down a criminal debt when he falls for local diner waitress (Cinderella’s Lily James) which has him kinda sorta reconsidering this whole wheelman job. If all this sounds familiar that’s because it is, but Wright, like all the great remix and mashup artists of our times, finds a way to make the old seem fresh. You see, Baby has a bad case of tinnitus, and in order to concentrate he drowns out the ringing in his ears by listening to music on his iPod (actually, a series of specifically tailored iPods). Through that one, seemingly minor twist, Wright has devised quite a clever storytelling device: the entire movie, from action, to imagery to dialogue to cuts is entirely set and synchronized to 30 tracks from Baby’s song collection. In this sense, Baby Driver is a crime drama/music video hybrid. Past films by Edgar Wright have similarly crossbred disparate genres and modes of filmmaking. Shaun of the Dead is a very British romantic comedy fused with a zombie horror film. Hot Fuzz is equally an ode to The Wicker Man as it was John Woo & Michael Bay, and so on. Baby Driver takes its cues from the stylized crime capers of Walter Hill, Michael Mann, Quentin Tarantino, and Guy Ritchie while infusing his own unique and often lyrical, Jacques Tati-lite sensibilities better than he ever has before. It’s a movie that doesn’t just wear it’s influences and style on its sleeve, it also is about how as people, we use pop as a means of expression and coping through our experiences. Not every track that drives Baby and the movie exists for rhythmic filmmaking. Many of the songs are used thematically, whether it be the lyrics of “Nowhere to Run” by Martha and the Vandellas used as an omen for Baby during a pivotal moment, or how “Debora” by T. Rex is the song that endears Baby to his love interest (guess what her name is?). Other songs are used when Baby simply needs a good beat to get moving to. Think about it: How many of us go day to day listening to the “right” kind of music to put us in the mood to work, to play, to drive, to make love or to fight? Baby Driver may be a largely surface affair but it’s so perfectly keyed into how music (among other forms of pop art) is irrevocably tied to how we live, think and feel…to how we move. Baby Driver works with the grace of a ballet dancer to move you. It’s an exercise in cinema as a sensory experience, all about syncopated and often restless motion. Every camera movement and cut is orchestrated with killer timing and an elastic physicality demanded of pop pastiche as form. This has always been baked into Wright’s entire oeuvre. He’s a cinematic DJ and constantly mixing, remixing and matching beats, often reshaping them into whatever he needs them to be when the time comes. He’s a lot like Baby himself, who in the movie records his conversations before chopping and mixing them into songs. Baby Driver is so enjoyably rhythmic and propulsive it somehow manages to outrun its own sometimes glaring flaws. Baby himself is somewhat of a nonentity. He’s cut from the same cloth of all Edgar Wright protagonists in that he’s a manchild caught between the comforts of stagnancy and the passions of his youth versus his need to step up towards true maturity and adulthood. And like most Wright protagonists, the entrance of a woman into his life is the impetus for his actualization. This could still be compelling in and of itself but here Baby’s a bit more of a blank than as usual for Wright. This may have been on purpose, to allow us to project ourselves onto him, but Ansel Elgort’s fluctuating screen presence doesn’t help matters. The surrounding cast does much better, and I couldn’t help but consider them a much bigger draw than our title hero. Jamie Foxx taps into that pre-Oscar impish comic persona as Bats, the wildcard of our heist crew. It’s been a good long while since I’ve seen Foxx be so charismatic and so willing to “go there” with a performance. Kevin Spacey does his deadpan comic Machiavelli schtick here to great effect. Lily James, while not given much to do, makes the most of her limited role reminding me of why she was such a brilliant center in Branagh’s 2015 Cinderella. However, it’s Jon Hamm and Eliza Gonzoles, playing thrill-seeking lovers with the kind mad dash of fire and passion that oscillates between saccharine and psychopathic, who run away with the movie. I couldn’t get enough of the two on screen. Hamm in particular delivers an incendiary physical performance I never thought he was capable of. And Gonzoles, though noticeably shortchanged in terms of screen time and dialogue, oozes with the kind of fiercely femme sexuality notably absent from Wright’s much more bro-y or stuffy British works. Baby Driver’s ensemble is quite literally firing on all cylinders. 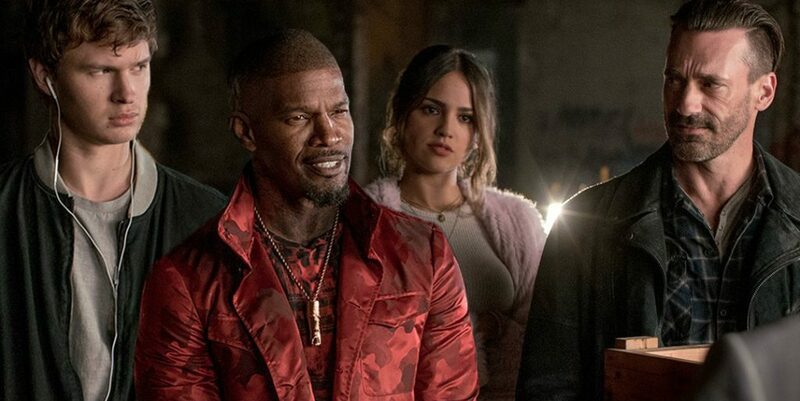 The energy about Baby Driver is so infectious it’s enough to make what on paper seems like a haphazardly put together climax (thematically, plot wise, and character-wise) seem like one for the ages. Which is par for the course with Wright, really. Without driving into spoiler territory, like many of his movies’ finales it is reliant on the audience feeling or thinking about our heroes in a specific light even if logically or emotionally certain actions and consequences don’t quite track with that. The movie never breaks itself in major ways but there is definitely a discussion to be had about movie POV clashing with audience POV. When Baby Driver works, every note and every cinematic flourish or allusion gives you a special kind of contact high, like when a pal introduces you to their favorite song or movie. There are, however, times when it veers off into the kind of suffocating mass of self-satisfied cinephillia last year’s La La Land was often accused of being. Baby Driver concerns itself more with putting together a custom ride rather than re-inventing the wheel and many of its foibles are simply a byproduct of its aims and form. Still, there’s so much to love with regards to Baby Driver. There’s just so much genuine cinematic technique and the level of craft here on display is on a level that can’t be taken for granted. The photography by Bill Pope; the editing by Paul Machliss and Jonathan Amos; and the stunts coordinated by Darrin Prescott work in concert with Wright’s direction to great effect. This is a such a well put together movie that part of you may walk out wishing for it to go deeper, to maybe muscle past it’s clichés and cine-quotes so that all that craft and technique can find something with a little more meat on the bones. Admittedly this is kind of a selfish quibble given how much this movie accomplishes in a form as content vindication of its director. Baby Driver so perfectly encapsulates everything that Edgar Wright has been about as a filmmaker up to this point and a pretty good movie to boot. Whatever comes next, this is his baby. Stefano De La Cuesta is an utterly fabulous Filipino ad man living in Chicago. He tells people his favorite movie is Chungking Express but it might actually be Weekend at Bernie’s. You can read his other writing here. Next → Next post: Deadshirt is Reading: Deathstroke and Snotgirl!